Sriram Krishnamoorthy (right) are part of PNNL’s HPC group. 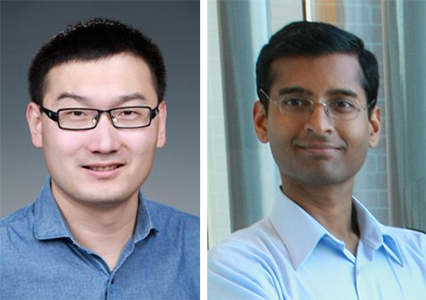 Bin Ren, a postdoctoral research scientist, and Sriram Krishnamoorthy, staff scientist and System Software and Applications Team Lead, both from PNNL’s High Performance Computing group, are co-authors of a paper, “Efficient Execution of Recursive Programs on Commodity Vector Hardware,” which recently was accepted by the 36th Annual Association for Computing Machinery Special Interest Group on Programming Languages (ACM SIGPLAN) Conference on Programming Language Design and Implementation, known broadly as PLDI. This year, PLDI 2015 received a record number of submissions, 303, and accepted only 58 papers. Synopses of these papers are now available online. In the paper, co-authored with collaborators from Purdue University and Washington University in St. Louis, the researchers present a set of novel code transformations that expose the data-parallelism latent in recursive, task-parallel programs to allow them to be mapped efficiently to commodity vector hardware. For Ren, the paper’s primary author, it is his first paper accepted by PLDI, while this marks the third consecutive paper featured as part of the programming language conference for Krishnamoorthy. PLDI is the leading forum for all areas of programming language research, including design, implementation, theory, and efficient use of languages. PLDI conferences emphasize innovative and creative approaches to compile-time and runtime technology, novel language designs and features, and results from implementations. PLDI 2015 is being held in conjunction with the week-long ACM Federated Computing Research Conference at the Oregon Convention Center in Portland, Oregon. PLDI 2015 will run June 13-17, 2015. Ren B, Y Jo, S Krishnamoorthy, K Agrawal, and M Kulkarni. 2015. “Efficient execution of recursive programs on commodity vector hardware.” In Proceedings of the 36th ACM SIGPLAN Conference on Programming Language Design and Implementation (PLDI 2015), pp. 509-520. June 13-17, 2015, Portland, Oregon. ACM, New York, N.Y. DOI: 10.1145/2737924.2738004.